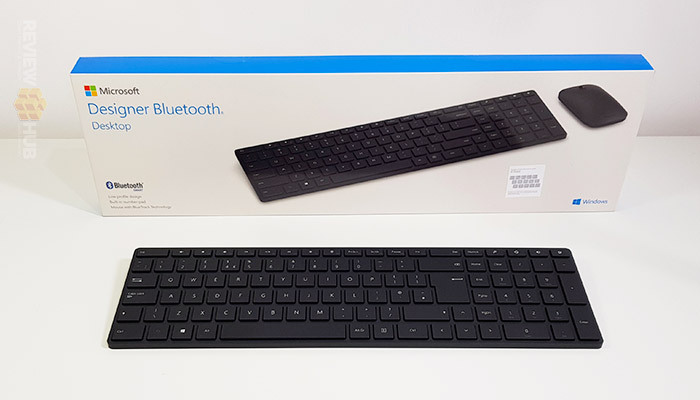 Having spent the last 4 week with the Microsoft Designer Bluetooth Keyboard, I Love It! I’ve been reviewing both the Microsoft Designer Bluetooth Keyboard and also the Microsoft Surface Keyboard for the last four weeks. And everything in me wants to love the Surface Keyboard more, but I can’t deny the improved typing experience on the Designer. While it takes a bit of getting used to the condensed layout, once you master it you have yourself a full sized yet portable Bluetooth keyboard with premium chiclet keys to match. Add on a reliable Bluetooth connection, the premium build quality and I’ve just found myself a new daily typer. And best of all, it’s cheaper than both the Modern & Surface Keyboards plus comes with the added bonus of an included mouse. Although you’ll probably give this away. So the question is: Can the Microsoft Designer Keyboard beat the crème de la crème Microsoft Modern Keyboard for the top spot? Let’s find out in this in-depth hands-on review. Straight out of the box, I had to use the good old tooth-test. At a lightweight 504 grams and feeling very similar to my Surface Keyboard, for a moment, just a moment, I had an inkling this keyboard was painted aluminium. But alas, the tooth test never lies, the Microsoft Designer keyboard uses a plastic build. Twisting the keyboard shows that it does have a little give (unlike the aluminium Surface Keyboard), but important there’s no central flex when typing. The Designer Keyboard is supported all the way across the back thanks to the rectangular elongated battery compartment. Unlike the Microsoft Wireless 900, the Designer Keyboard feels premium although plastic. If your friends ask, just tell them it’s polycarbonate! Way cooler. As for the fonts used, this keyboard opts for the thinner variant typeface which gives it a different look to the Modern & Surface Keyboard. Upon close inspections, the key print quality is high. One downside though is that Microsoft has scrimped when it comes to backlit keys. It’s a simple task to backlight keys which makes me think that Microsoft is holding out on us. Maybe we’ll see this in the Designer Keyboard 2? We do get backlit ‘Fn’ & ‘Caps Lock’ keys, which is important as we have joint media / ‘F’ keys. One omission to this is the ‘Num Lock’ key, which feels like an oversight on a keyboard that has gone to the effort of having a full number pad. In terms of design, the dark colour scheme does mean that dust, grease and fluff do show up easily. After only a couple of weeks, I had to give the Designer Keyboard a quick wipe down. There’s no mention of waterproofing, but a damp cloth hasn’t broken mine yet. One strange issue I found on my unit, is that the key lettering is slightly misaligned, or for a better word ‘wonky’. I suspect this is limited to a certain production run, and yours will be printed correctly. Since I’m a stickler for alignment, I’ll be getting a replacement soon. Overall though, I’m more than happy with what the Designer Keyboard brings to table. I just wish they’d make a silver aluminium one! A Designer Modern Keyboard Clone maybe? If you use a laptop regularly, the chiclet style keys will feel familiar. They’re don’t use an ultra low-profile like the new MacBook Pro or Lenovo’s 2018 range, but are much faster to type on than traditional keyboards. To make the Designer Keyboard as compact as possible they’ve squished the right-side number pad left-wards which doesn’t leave any room around the arrow keys. This takes a bit of getting used to, but I think it’s a wise compromise. Control and Shift have also been moved closer to the space bar, which I find makes them much easier to reach when typing. The best way to describe the Designer Keyboard is as a keyboard with a learning curve. Many of the buttons have moved from their traditional stations, not far but enough to perplex my monkey brain. Monkey don’t like change! But there’s a silver lining. After a few days using the keyboard, your mind will adjust to the new layout. Personally, I’ve come to really enjoy the compact form factor. The only layout decision that I disagree with is the ‘Delete’ key. Having this on the top row alongside the ‘F’ keys still hurts my Monkey brain even after 4 weeks. 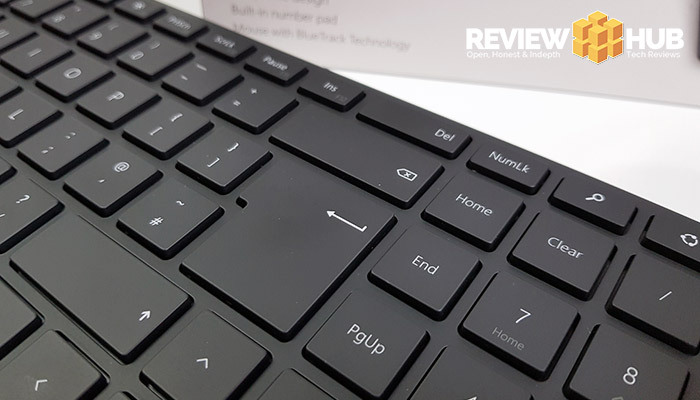 Finally, a few extra features that make this keyboard stand out are the ‘Right Click’ key to the right side of the space bar, the Windows Quick Access buttons (above the number pad) and the double sized enter key. Let me make it clear that the Designer Bluetooth Mouse is quite simply average. It’s inoffensive and lightweight but not up to the challenge of being a serious productivity mouse. It only has the 3 buttons (Left, Right & Scroll Click) and the scroll… erm scrolls unsatisfyingly. We’re missing sideways scroll and forwards / backwards. It baffles me that Microsoft sells this mouse separately for £30. The low profile of the Designer mouse combined with the lack of functionality means it won’t be replacing my Logitech MX Master 2S anytime soon. 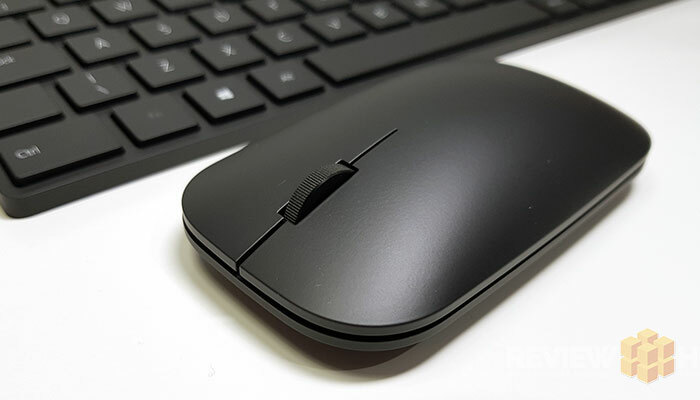 Microsoft should have a strong think about including the Sculpt Mouse with the Designer Keyboard. It’s a much better option in my opinion. The Designer Bluetooth keyboard used the same magnetic cover over the battery compartment as the more expensive Surface Keyboard. Rather than a tube on the Surface, the Designer Bluetooth uses a square design which gives the keyboard a sturdier base. Powering the keyboard is two AAA batteries that are included in the box. There’s a Bluetooth pairing button opposite the battery compartment that’ll let you repair the keyboard if needed. I didn’t have any issues with the Bluetooth connectivity. It connected first time, and typing has responsive ever since. 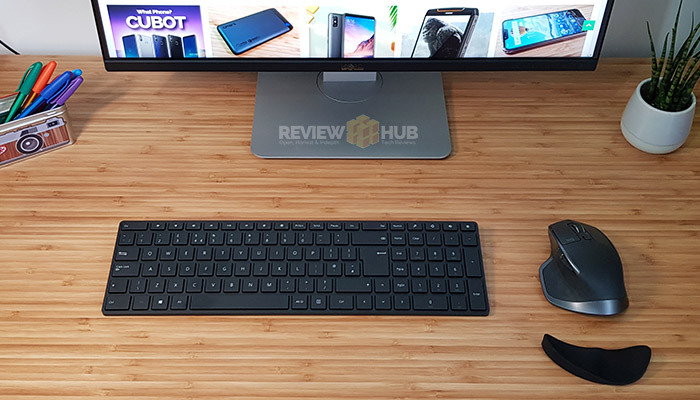 Unlike Logitech’s quick solution for switching between devices, you will have to repair the Microsoft Designer keyboard each time you use it on a new device. Also, there is no adapter or Bluetooth dongle included, so if you’re using a PC you might have to purchase a dongle separately. 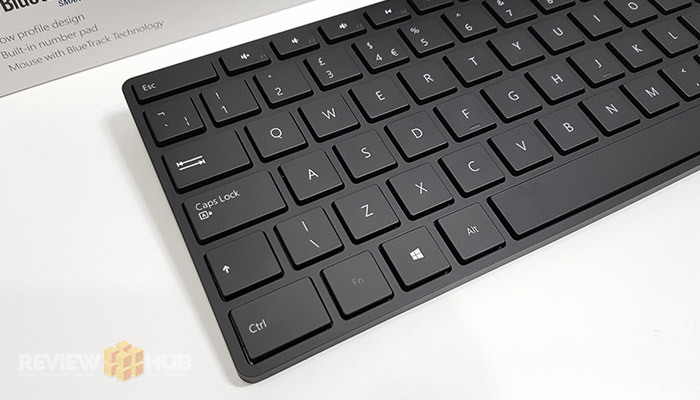 The Microsoft Designer Keyboard isn’t the perfect keyboard by any means, the lack of backlit keys, the strange location of ‘Delete’ and the included mouse stop if from gaining full marks. But, if we set the mouse aside, and only review the keyboard, there’s a hell of a lot to love. As soon as you take the Microsoft Designer keyboard out of the box, you get the sense you’re dealing with a premium piece of kit. The typing experience is excellent, and I even think it wins over the Microsoft Surface & Modern keyboard for this. The key-press volume is low, it’s lightweight, portable, the angle is good and the Bluetooth connection is reliable. We even get a 3 year warranty compared to the Surface & Modern Keyboards 1 year. Could this keyboard be better? Yes, they could add the Microsoft Sculpt mouse for starters… but overall it’s still good value for money. 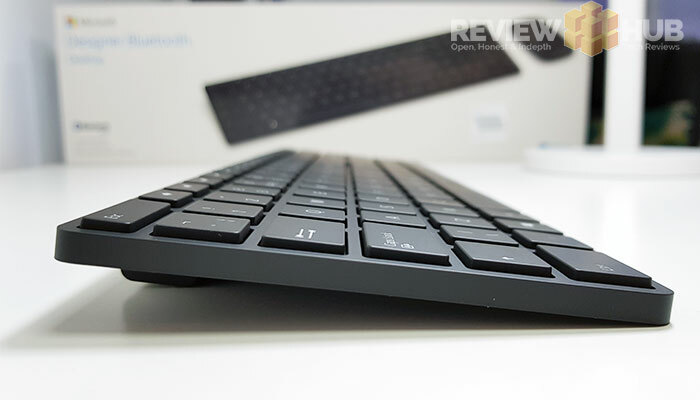 Do we recommend the Microsoft Designer Bluetooth Keyboard? It’s a YES!